1. Clarify role of interviewee and basis of interviewee's understanding of child protection legislation and volunteering. a) Has it been beneficial in ruling out potential volunteers who have criminal records? b) Is there evidence of this – ie number of positive disclosures? c) Is there any indication of the number of people who have not put themselves forward for volunteering because they have a criminal record which would have prevented them volunteering? a) Are potential volunteers deterred by the need to have a CRB check? b) Are potential volunteers deterred by the process of the check – i.e. inability to produce the forms (young people, recent immigrants, people who have recently changed address), or put off by the physical process of producing the forms? c) Is there a perception by volunteers of invasion of privacy/lack of trust? e.g. is the long-standing volunteer insulted by being required to do this check? d) Is there a lack of capacity at club level to manage the checking process? e) Does it involve too much bureaucracy at local and national levels, slowing down or stopping volunteer recruitment generally? f) Does the level of organisation taking the decisions to stop volunteers mean more people are prevented from volunteering? e.g. are national decisions more exclusive than local decisions? g) At the local level, is it clear and consistent which offences preclude people from doing which jobs? h) Is the implementation of the legislation too indiscriminate? i.e. is there a danger of anyone with a criminal record being rejected? If a potential volunteer proves to have an offending record which prevents them working with children but does not prevent them doing other jobs for the club, how is this handled? Is it handled in a way that will still allow the person to volunteer? i) At club or SGB level, is there an unwillingness to use discretion once a disclosure check has come through? j) Is there a concern, at club or SGB level, that there is a lack of more precise guidance on how to use discretion? k) Does child protection prevent or reduce 'hosting' arrangements for child competitors at events? 5. What is your knowledge of proposed legislative changes for 2009? 6. And what is your reaction to proposed legislative changes for 2009? Will it reduce problems? 7. Is there universal support for the need for child protection legislation regarding sports club volunteers? 8. How seriously is child protection legislation taken at national and local levels? Prompt: One extreme is the appointment of child protection officers, policies, training, and embedding disclosure procedures and volunteer training into systems. The other extreme is to carry on as before and only implement disclosure procedures partially or 'do the bare minimum necessary'..
9. Have attitudes to child protection legislation changed over time? Prompt: e.g. initial support in principle but later, when experienced, raise objections; or alternatively, initial fear of implications but later, when used to the processes, they become part of normal practice. 10. What differences, if any, have there been in the effects of child protection legislation between national bodies (e.g. SGBs) and local organisations (e.g. clubs)? Please complete the questions below by typing in the shaded areas, checking the appropriate boxes or selecting an answer from the drop-down menus as appropriate. 4.How many adult members [18 and over] are there in your club? 5.How many junior members [under 18] are there in your club? 8.In the past 2 years how many disclosure checks have you asked for? a) you could not use a volunteer as the applicant was automatically excluded from working with children. b) a decision had to be made about the suitability of the applicant – either by your club or by the sport's Governing Body. 11.In the past 2 years how many potential volunteers that you have asked to take a disclosure check have not actually taken it, for whatever reason? 14.Please indicate your overall views on how complying with child protection legislation affects your club, by ticking one of the following that you most agree with. a) It is essential to do it properly, as it protects children, although it involves work for our club. b) It is a good idea in principle, and it is a legal requirement, so we need to do our best to implement it in our club. c) It is generally a good idea, but the practical problems of implementing it in our club mean we can’t apply it completely. d) It raises so many practical problems that it is too difficult for our club to implement it. 15.Apart from disclosures, does your club use any other child protection measures or recruitment practices which might help child protection? Please select all that apply. Only answer questions 16 - 20 if you act as the Child Protection Officer/Coordinator for your club. 18.Where has the information you have on child protection and disclosure checking come from? Please select all that apply. b) If no, what aspects of Child Protection and disclosure checking would you like more information on? Please save your completed questionnaire and e-mail it back to us (). If you have any questions, please feel free to contact me by e-mail or by phone 0114 225 2535. Thank you very much for your help with this survey. 3.How many adult members [18 and over] are there in your club? 4.How many junior members [under 18] are there in your club? 5.Where has the information you have on child protection and disclosure checking come from? Please select all that apply. 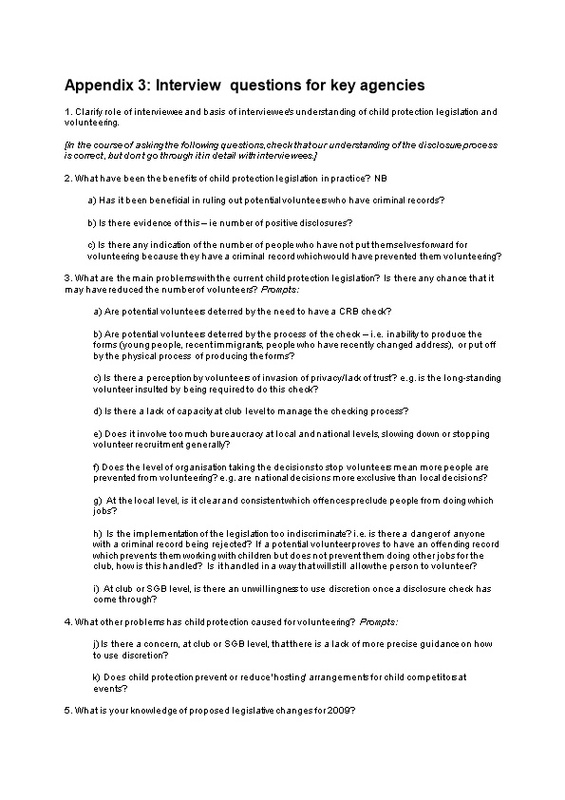 7.If you do not – what aspects of Child Protection and disclosure checking would you like more information on? 8.Apart from disclosures, does your club use any other child protection measures or recruitment practices which might help child protection? Please select all that apply. 9.What have been the main benefits of the implementation of Child Protection legislation? 10.a)What have been disadvantages of the implementation of Child Protection legislation? 10.b)Why have there been these disadvantages? 11.As a club child protection officer, what problems have you had to overcome in implementing the legislation? 14.b)If yes, from whom do you receive this support? 15.b)If yes, what would it help you with and how could it be provided? A volunteer will only have to make one disclosure to get their name on a central register. So they will not need to do a separate check for each organisation they volunteer for. If someone has already had to make a disclosure for paid employment, they will not have to make a separate one for volunteering. Similar checks will be required for working with vulnerable adults. Retrospective disclosure may be required – so all volunteers will have to go through the process. What are your views on these changes? d) Is there a lack of capacity at school level to manage the checking process? h) Is the implementation of the legislation too indiscriminate? i.e. is there a danger of anyone with a criminal record being rejected? If a potential volunteer proves to have an offending record which prevents them working with children but does not prevent them doing other jobs, how is this handled? Is it handled in a way that will still allow the person to volunteer? i) At school or local education authority level, is there an unwillingness to use discretion once a disclosure check has come through? j) Is there a concern that there is a lack of more precise guidance on how to use discretion? 7. Is there universal support for the need for child protection legislation regarding sports volunteers? 8. How seriously do you think child protection legislation taken at national and local levels? Prompt: One extreme is the appointment of child protection officers, policies, training, and embedding disclosure procedures and volunteer training into systems. The other extreme is to carry on as before and only implement disclosure procedures partially or 'do the bare minimum necessary'. This survey is designed to find out how you feel about child protection legislation and disclosure checks of volunteers. It is being conducted by the Sport Industry Research Centre at Sheffield Hallam University, for sportscotland and Children 1st. It is very important that sportscotland has your opinions because child protection legislation is being changed and the views of club members and volunteers are vital to ensure the changes are appropriate. As an incentive to take part in the research, sportscotland will enter completed surveys into a prize draw offering one lucky club £200 of sports equipment. We do not ask for your name or contact details and all your responses will be treated as confidential so please answer as honestly as you can/ If you are happy to process, thank you for agreeing to help. 1a. Name of sports club? 2. Are you a parent/guardian of a child/young person (under 18) who participates at this or another club? 3b. Were you a volunteer at this or any other sports club in the past? 4. For approximately how many years have you been a volunteer at this club? 5a. As a volunteer at this club, do you help with children or young people (under 18 years)? 5b. Do you help with children or young people in any of the following roles? 6. For approximately how many years have you been helping with children or young people? 7. As a volunteer at this club, have you been asked to complete a Disclosure Check? 8. Please indicate your level of agreement with each of the following statement by marking the appropriate box in each row.